Our Sustainable Salmon Class & Tour Package offers the opportunity for a private tour of the Sustainable Blue Land Based Fish Farm, followed by a Hands-on Cooking Class where you’ll learn to break down a whole salmon. This package includes: Friday night Accommodations, Breakfast, Guided Tour of the Sustainable Blue Fish Farm, 2 Hands-on Class Registrations, a whole salmon per couple to fillet and cook with (take the rest home!) and Lunch on Saturday (in your class). 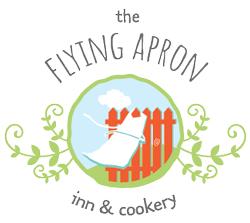 We will leave The Flying Apron by 10:45 for your behind the scenes tour. This package includes accommodations in our beautiful Inn on Friday night. A hot, fresh breakfast on Saturday morning is included!